Alternative Tile Sets and Tile Sets of Questionable Manufacture. This Gallery features tile sets that were used for games other than Mahjong(g). 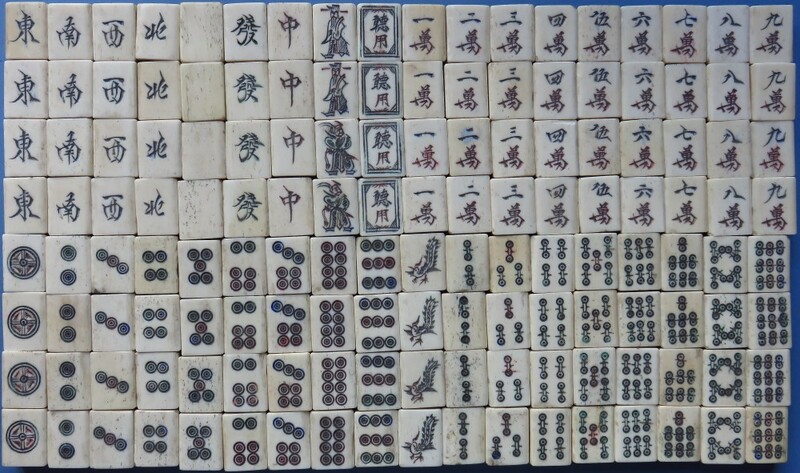 It also features Mahjong(g) tile sets that have a questionable provenance but nevertheless sport interesting tile patterns and styles of engraving. Descriptions of the particular tile set are found under each entry. 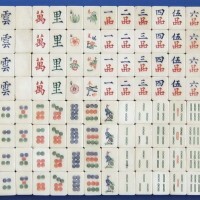 132 wa hua tile set. Complete game set. 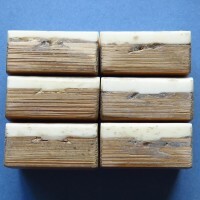 This is a set of domino tiles constructed of bone dovetailed into a bamboo base. The previous owner's daughter testified that her grandfather owned a factory in China and he bought these tiles at that time - which suggests the early 20th century. The tiles have a concave bone surface. 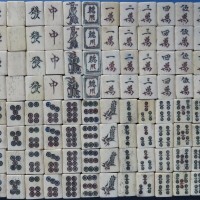 According to Andrew Lo in 'Asian Games; the Art of Contest'; " The top three rows are known as 'hua pai' ("tiles with flower"), which yield the most valuable points. In the top row the numbers on the tiles are doubled and this set is termed 'dài dà' ("big, doubled"). The tiles in the top five rows are arranged in order of descending value from left to right, while in the bottom row they are shown in ascending numerical order. "[Lo, Andrew, in Asian Games The Art of Contest. Asia Society, 2004). I thoroughly recommend this book for Lo's excellent essay on the history of Mahjong. 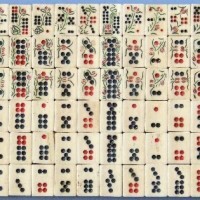 See also the article on this site titled "Má qiǎo/má què terms 1780 – 1920" for a fuller explanation as to this game's link with Má qiǎo/Mahjong(g). 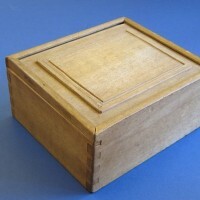 This box was made by one of the workmen who worked in the factory. 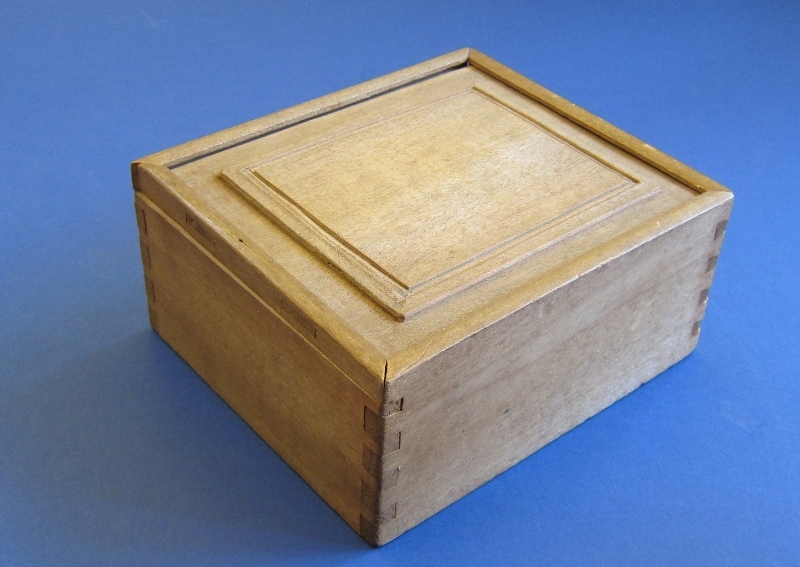 Wooden, cubic shaped with a slide top lid. Blue (qīng) Mountain (shān) White (bái) Clouds (yún) tile set with the Honours tiles being white (bái), myriad (wàn) and inner/village/length (lǐ). This is a mahjong set that was produced very recently. The Myriads suit has been replaced with the pǐn (ranks) suit. I have classed this set as an 'alternative' to highlight that it contains alternative groups of tiles plus that it is of a recent origin. 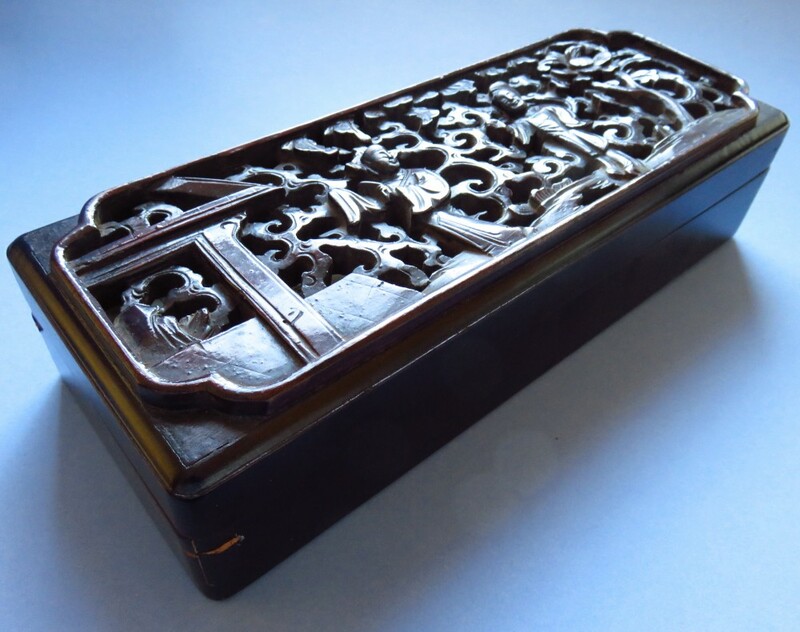 The engravings and colours are of slightly inferior quality as is the bamboo base. The style of the 'Bamboos' suggests the use of a pantograph in the engraving process. Northern Style Tile Set a. The 1st impression garnered from these tiles is the poor quality of their dimensions. There appears to be no uniformity and hence the tiles fit haphazardly together. The tiles also appear to be dirty as if well used, but the paint in intact and its quality is uniform across the set. However, the style of the engravings is interesting. The late Japanese Mahjong Museum 1st edition red book, features four tile sets with this pattern over pages 64 and 65. According to the caption under Photo 101, the 101 set includes a specific 'Joker tile' used in North China. Three of the four tile sets featured also include this tile. All four sets also have what appear to be coins used for the 'Bamboo' suit. However, these might be representations of the ends of bamboo rods. The tile set featured here in this Gallery has engraving patterns that are consistent with the tile set 101 in the Museum's book. It features the same #1 Circle engraving, the red #8 'Circles', the same framed 'Joker' tile and the same 'cursive' style to the engravings of the 'Characters' suit and the same style of engravings for the Directions and 'Dragons'. 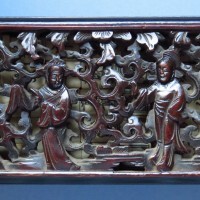 It also features 2 pairs of 'Gods of Wealth' with the same style of engraving as in the Museum book's photo 102 tile set. 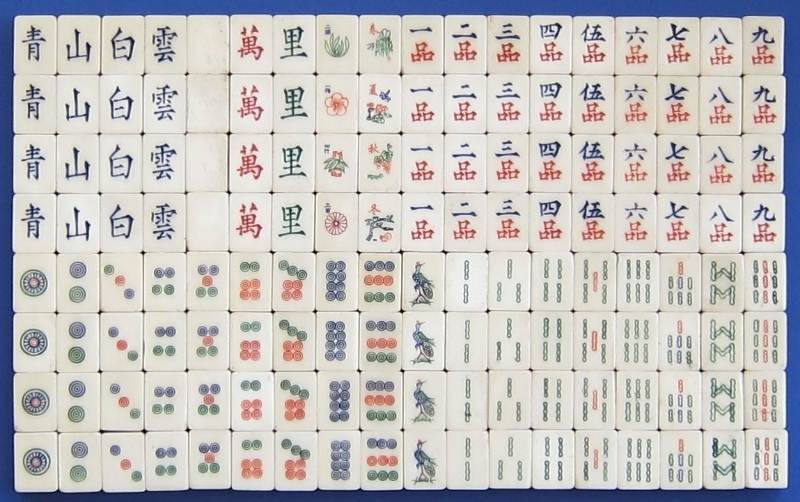 The use of the 'Joker' tile was indeed used in the game called 'Northern China Mahjong' that was played in Beijing and Tianjin, according to Liu Yishu in his 1941 book "Maque's Experiences and Skills". Each 'Joker' tile features a pair of sinograms, ting yong = "multipurpose" tile. According to this book the tile could act as any of the tiles in the Cash/'Circles', Strings/'Bamboos', Myriads/'Characters', Directions/Winds or Honours/'Dragons'. 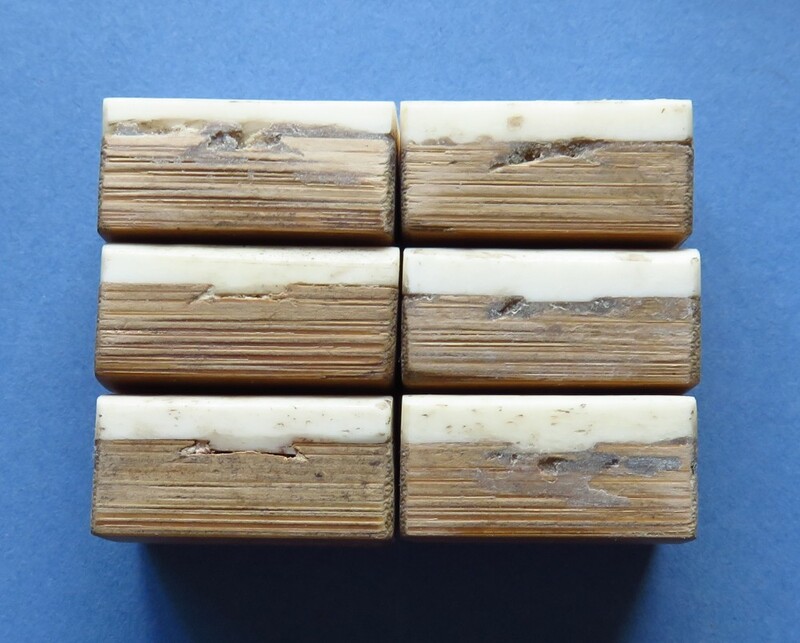 For more information about the different type of the Northern Mahjong tile set, see the article 'Flowers and Kings: A Hypothesis of their Function in Early Ma Que' in the Tile Set History section. A similar set is featured in the 'Guest Contributions' Gallery. It also features slightly different engraving patterns in some groups. Northern Style Tile Set b. Side view of various tiles. This image is a representative sample that illustrates the state of tiles in the entire set. 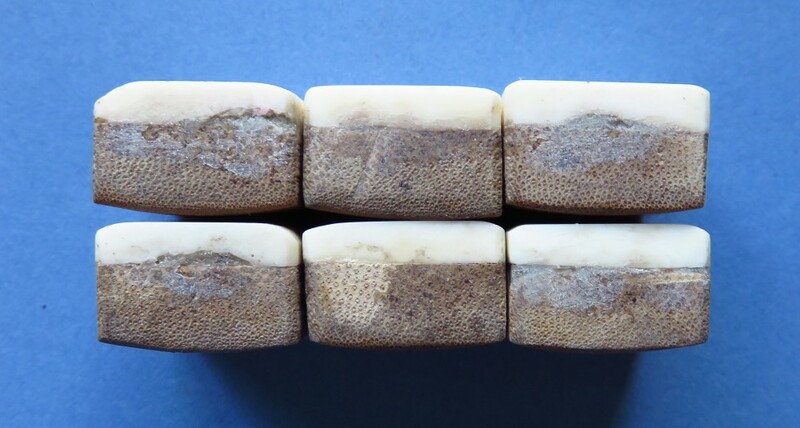 Note the absence of dovetails, the poor quality of bone and the lack of uniformity. Northern Style Tile Set c.
End view of various tiles. Again note the poor quality of the bone and the appearance of what seems to be an attempt to 'age' the tiles artificially. The tiles have what appears to be staining and the application of an ash-like substance to the entire tile. 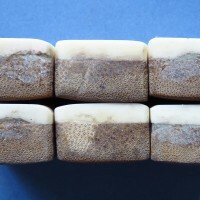 The appearance of the tiles might be the result of an attempt to use an older tile set that had its bamboo bases removed and new ones supplied. In the joining or removal process many of the dovetails were therefore destroyed. Following that process the tiles were deliberately aged. Northern Style Tile Set Box a. 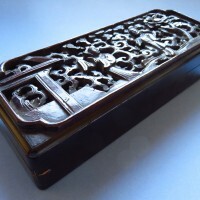 Box with perforated carved lid of good quality. Northern Style Tile Set Box b. Top view of the box lid showing the quality of the carving.